Here's a good example of how the Atlantic Council gushes over al-Qaida and friends in Syria: https://t.co/d8w9gTxrep. A back and forth with Phillip Smyth and others. Abrahms points to the last paragraph specifically. Mehdi Hassan agrees. "the last para is indeed gushing/awful. Al Qaeda's 'local prestige and goodwill'. Ugh." Ironically, the only parties showing creativity and adaptability in Aleppo are the beleaguered rebels themselves, who are trying to break the siege from inside and outside of the city. The most powerful component of this insurgent alliance is Jaish al-Fateh, a coalition dominated by the hardline Salafist groups Ahrar al-Sham and Jabhat Fateh al-Sham—until recently known as the al-Qaeda affiliated Nusra Front. These groups have combined military performance with a grasp of local sentiment, emerging as the insurgency’s vanguard in Aleppo. Should they successfully break the regime’s siege, these hardliners may well be the real winners of the battle for Aleppo. Their victory would boost the depressed position of their Turkish and Arab backers and embarrass the United States. Alternatively, the siege may endure, which would simply highlight US failures in Syria. Regardless, these rebels’ local prestige and goodwill as the main anti-regime force amid Western disengagement will sustain them for now, in Aleppo and beyond. I reply, jumping in, agreeing about the piece, but adding that there is no science of tone. 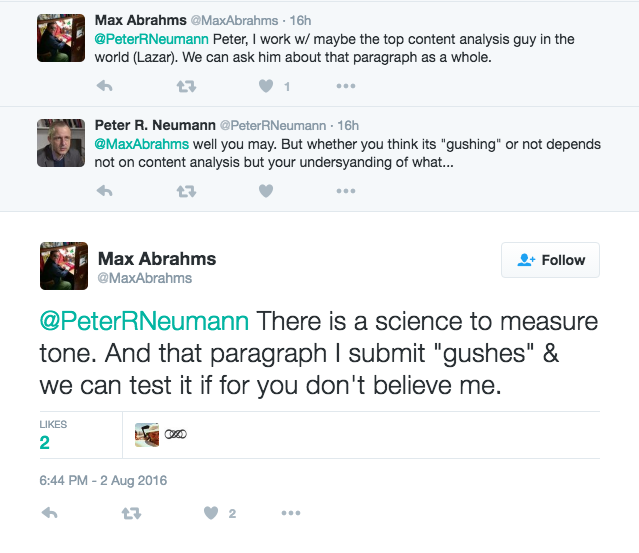 Abrahms responds: "You sure about that?, linking the below. As with any type of research, the process of conducting a content analysis project begins with the selection of a main research question or goal. What is it we are trying to answer? All of our subsequent decisions are aimed at best answering that main question. For all studies, we must select the sample of material to examine, which is often more difficult than it sounds. Choosing a sample involves both a focus on thoroughness, representativeness and the purely practical question of availability. Depending on the scope and goals of a project, we might code every story in a given news outlet, or we might use various search techniques to find specific articles relevant to our analysis. In recent years, the center has conducted analyses of many types of outlets, including print, online news sites, network TV programs, cable TV programs, radio broadcasts, blogs and tweets. Sometimes, the research question is focused on understanding the scope of coverage of a particular news outlet. In these cases we generally code every story – or at least a large, representative sample of stories – contained within that outlet during a given time period. Other times, the research question is focused on the way a particular news topic, event or issue is covered. In those cases, we generally use various search techniques to collect the relevant materials. Within a few minutes he was pulling rank. I asked him to do a "content analysis" of the Constitution, and Shakespeare -later it became more specific: The Second Amendment, and Olivier's Hamlet (the scene with his mother). I said he was sounding like Scalia, and posted a link to Jack Balkin's "Why are Americans Originalist". He replied, "That paper has 3 citations :)". After then it became whether Jack Balkin or David Lazer is higher on the academic food chain. Twice this week on twitter I've linked to this. How do you code for irony? In one of my first responses to Abrahms I stipulated that journalism was hackwork, so at one level deserved no more than a simplified and therefore vulgar reading: "Now code me Shylock or the Constitution". It went on, and went nowhere. I can be surprised still how much bureaucratic logic has dumbed down the academy. A few people (from The Atlantic Council!) came to my defense, accusing Abrahms of being a bully. I told them it wasn't an issue. As always I take comfort in the existence of actors, poets, con-men, comedians, and lawyers. A link from Matthew Scott of Barristerblog. I was confident I could succeed because I had never lost an argument. Or so I thought. My armoury of dispute resolution skills included a dogged intransigence, an inexhaustible energy for prolonging the argument and a facility for slyly belittling my opponents and their positions. Arguments always ended the same way: with my opponent calling me a colourful name and refusing to engage with me any further. I was left alone on the battlefield, victorious. Except, of course, in truth I had lost the battle and the war. What it took me an embarrassingly long time to grasp is that effective advocacy does not depend on having an unshakeable confidence that you are right. It does not even depend on actually being right (though that obviously helps). It depends on being able to persuade someone else that you are right. The unacknowledged truth about advocacy is that it is a sales job. You are trying to persuade the adjudicator to buy the case you are selling. It turns out that requires a completely different skillset to the one I had been developing. Interesting and amusing update since Abrahms was criticized by an Arabic speaking journalist for not knowing the language. Elijah Magnier responds. In the next tweet Magnier says that Abrahms works with him. Magnier is fluent, and he's on the ground. Senior Political Risk Analyst with over 32 years’ experience covering Europe & the Middle East. Acquiring in-depth experience, robust contacts and political knowledge in Iran, Iraq, Lebanon, Libya, Sudan and Syria. Specialized in political assessments, strategic planning and thorough insight in political networks. Created and coordinated network of decision makers to provide key insight into the complex political developments of the Middle Eastern region. Experienced in dealing with intrinsically difficult situations in a broad spectrum of situations when interacting with leaders and fundamentalist movements in war zones and areas of growing instability. Magier is the tradesman, the connoisseur, the negotiator, the player. He's much more important to Abrahms than David Lazer.